An adjustment is our main tool when it comes to your care. The doctor typically uses his or her hands--or an instrument--to manipulate the joints of the body, particularly the spine, in order to restore or enhance joint function. It also removes nerve interference, and helps with a host of symptoms. We also adjust the extremities to help with such things as carpal tunnel, tennis elbow, and much more. This often helps resolve joint inflammation and reduces the patient's pain. 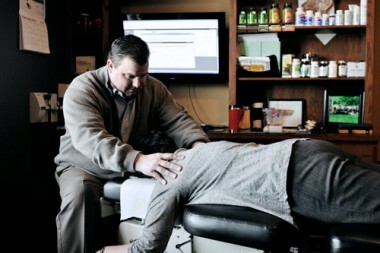 Chiropractic manipulation is a highly controlled procedure that rarely causes discomfort. The chiropractor adapts the procedure to meet the specific needs of each patient. Patients often note positive changes in their symptoms immediately following treatment. Most conditions take more than one treatment, but it is our goal to get you better in a timely matter. We offer a wide variety of manipulation techniques such as Diversified, Thompson drop, Activator, Flexion-Distraction, Cranial Sacral, Pediatric/Infant care, and Webster Technique at our clinic. During the treatment you may hear a popping noise. Don't worry! It is painless, and is just gas leaving a joint.